"We have worked with Gosh Golly for many years now and are delighted with the work they have carried out for us. 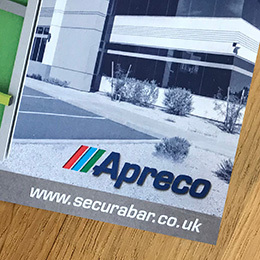 Our company Apreco Limited is a supplier to the Healthcare and Fire Industry so all project work needs to be of the highest quality, which is what we get with Gosh Golly. They are responsible for helping us designing a range of items from business cards to exhibition stands and Natalie has always been there to save us from ourselves, often at the eleventh hour. They understand the high standards that our company have and are most efficient in delivering well within time limits. I would highly recommend working with them."